Join over 550 foodies and wine lovers in support of the Vancouver Aquarium’s conservation, education and research efforts. Toast to the Coast transforms the Aquarium into a spectacular after-hours experience, and 100 per cent of proceeds support the Aquarium’s commitment to effecting the conservation of aquatic life and our waterways. 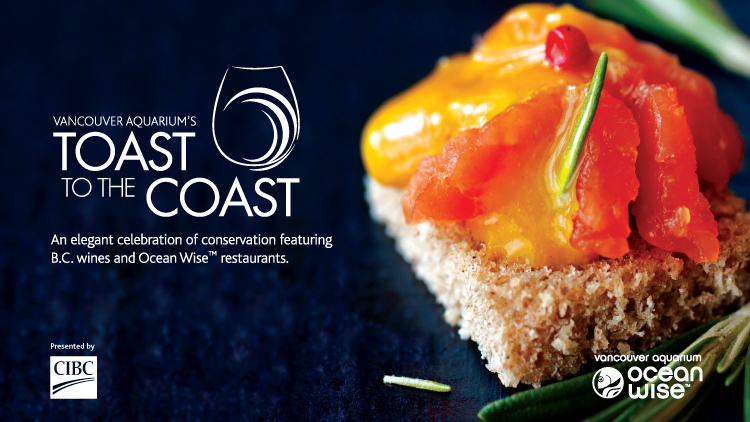 Graze on exquisite canapÃ©s from leading Ocean Wise restaurants, sample the best of B.C.’s local wines, enjoy live music from DJ Leanne and leave with chic items from the silent auction and fashion showcase. Participating restaurants include: Terra Breads, YEW Restaurant + Bar, The Sonora Room, The Sandbar, Miradoro Restaurant, the Donnelly Group, Oyster and Wild Rice. Participating wineries include: Hillside Winery, Tinhorn Creek Vineyards, Covert Farms Estate Winery, Poplar Grove, Red Rooster Winery, Quals’ Gate, Fort Berens Estate Winery and Blasted Church Vineyards.